The Internet has changed a lot about the way we consume the news. No longer can we watch tonight's news broadcast or read the morning's paper confident that we're staying up to date on the latest happenings—with the speed news moves Internet, these sources are more likely to be yesterday's news than today's. So just how are we to keep up with the latest? With news aggregators that run on the web or your mobile device. These handy apps and sites pull in news from a variety of sources and display them all in one place for you to easily read. Note: You may see the acronym "RSS" tossed around, but don't be scared off by jargon. RSS stands for Rich Site Summary and provides news aggregators a way to display the site's news. None of the apps we're going to recommend require any special knowledge pertaining to RSS feeds: just tell them your favorite sites or subjects, and they'll take care of rest. So are you ready to catch up on the latest news? These are our favorite apps for the task. No matter what news you want to keep up with and no matter where you want to keep up with it, we like Feedly. You can use it on the web or on your mobile devices, whether you favor iOS or Android, and your reading list will stay up to date between the different platforms if you read news both at home and on the go. When you first set up Feedly, you'll have a blank canvas, but it's easy to tell Feedly your favorite sites—or let Feedly recommend sites by topic. While you're accessing content by RSS, you never have to deal with it— just give Feedly the web address of any of your favorite sites and it will figure out the details on its own. And if you install Feedly's browser plug-in, it's even easier: you just need to click the browser button to add a new site to Feedly. Afterwards, Feedly will keep updating with the latest posts, so you can always know what's up. Because you can completely customize your reading list as well as access Feedly wherever you are, it's definitely our favorite way to keep up with the news. Flipboard is a bit easier to get started with than Feedly because instead of encouraging you to add your favorite sites, it places recommendations front and center, letting you follow subjects or popular sites as well as your own favorites. The downside to this focus on recommendations is that it's not possible to use Flipboard to follow any site you want: only sites Flipboard has approved show up in their search. But, still, you're likely to find most things you're looking for. Flipboard has an extensive selection of popular content. 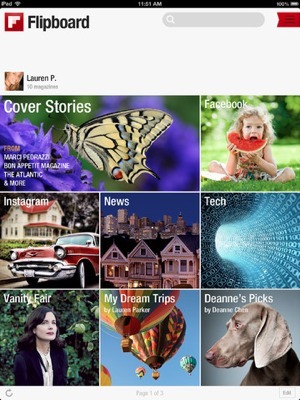 You can even create your own custom flipboard magazines of curated content for others to read and enjoy. Available on Android and iOS. If you just want to read the news—but don't want to put a lot of effort into which news sites to follow—Zite may be the app for you. Instead of adding sites, just tell Zite what topics you're interested in and it will compile a list of stories it thinks you'll want to read. 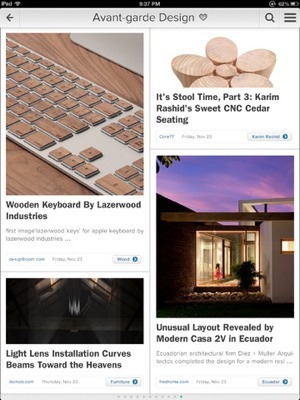 As you read, give articles a thumbs up or a thumbs down and Zite will know to show you more articles you like and fewer articles you don't—and given a bit of time, Zite will be good at directing you specifically to the news you're interested in, without any hunting on your part. Of course, this convenience comes at a cost: you can't manually add anything to Zite. If you want to customize your content, Flipboard or Feedly are the options you want. And Android users be warned: the Android version is designed for phones rather than tablets and doesn't have the slick, magazine styling of the iOS version. So while we do recommend it for iPhone and iPad users, Android users looking for a magazine-like experience should look to Flipboard. However, these downsides haven't stopped us from using Zite... at least on iOS. We hope you've found these recommendations useful. If we've missed any outstanding news aggregators, let us know in the comments section below. 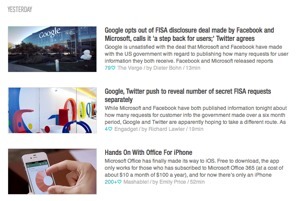 I’d say if you enjoy Zite try the app News360.